Lateral epicondylitis, more commonly referred to as “tennis elbow”, is a term used to describe pain just above the elbow joint on the outer side of the arm. Contrary to popular belief, tennis elbow is not a condition that is exclusive to tennis players or athletes. The term tennis elbow was coined from the fact it can be a significant problem for as many as 50% of tennis players during their careers. However, less than 5% of reported cases of tennis elbow result from playing tennis! More specifically, tennis elbow is a tendinopathy at the origin of the extensor carpi radialis brevis tendon (the tendon that is responsible for wrist extension). This tendinopathy is due to degeneration of, or damage to the tendon causing inflammation and subsequently, pain. In order to understand what causes tennis elbow, it is important to first understand tendons and how they function. Tendons are like “ropes” made of collagen tissue. They are flexible, but do not stretch when pulled. It is the job of the tendon to connect muscle to bone. 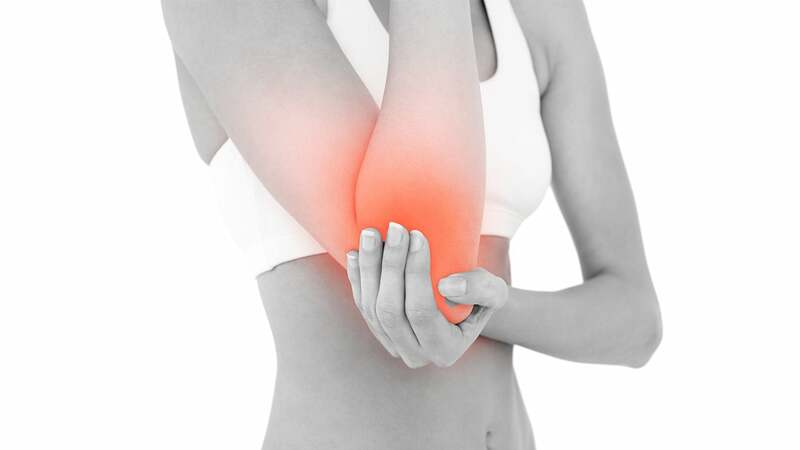 In the case of tennis elbow, the area on the bone where the tendons attach, just above the elbow on the lateral side (or outer side) of the arm, are sometimes incapable of handling the force of the arm muscles. Strong forces or sudden impact to the tendons at this point of attachment are what cause damage, like small tears in the fibers of the tendon (similar to a rope becoming frayed). Activities that exacerbate tennis elbow symptoms are those that involve repetitive motion of the arm, forearm, wrist, and hand. Movements that are commonly associated with the development of tennis elbow are: lifting, gripping something tightly in combination with inward or outward rotation of the forearm, jerky throwing motions, swatting with the hand, and simultaneous rotation of the forearm and bending of the wrist. Racquet sports may be the most “popular” activity to associate with tennis elbow, but as previously mentioned most cases are the result of a wide range of actions that include, but are not limited to: painting/plastering, excessive and repetitive use of a computer mouse, carpentry work, gardening and repetitive lifting and carrying. Tennis elbow can be suspected when performing routine tasks, such as gripping objects or turning doorknobs, become painful. A physician or physiotherapist can diagnose tennis elbow by discussing symptoms and examining the affected arm. Diagnostic tests are not typically necessary for an accurate diagnosis, however, a physician may request an X-ray or MRI imaging if symptoms do not improve with treatment. Treatment options for tennis elbow include modifying activities that exacerbate symptoms. Movements that cause an increase in pain should be avoided to help allow the tendon to heal. Pain management is also important to consider. Anti-inflammatory painkillers are commonly used for some symptomatic relief, however physiotherapy remains the most successful tool in the treatment of tennis elbow long-term. A physiotherapist will perform manual therapy on the affected arm, to mobilize the underlying stiff joints and tight structures. Modalities such as ice, and ultrasound, as well as taping may be used to ease pain and encourage healing. A physiotherapist will implement stretching and strengthening exercises to help restore normal function of the arm, and also prevent tennis elbow from occurring in the future. This entry was posted in injury prevention, Kitchener Physiotherapy, Pain Relief, pain treatment, Physical Therapy, physiotherapy, Preventative therapy and tagged elbow pain, lateral elbow pain, Lateral Epicondylitis, manual therapy, Physiotherapy, repetitive gripping, tedonopathy, tendonitis, Tennis Elbow on November 15, 2016 by bodytechphysio.